Laptop coolers are super important for better performance and longer life, even if you don’t always want to turn it on, just setting your laptop on one vs. setting on your lap or a desk will help extend its life and keep it cool. Most importantly it will increase the life of your hard drive and cpu. 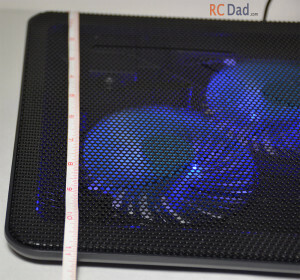 If you’re playing games or watching movies on your laptop then you absolutely need a cooler. I’ve compared the Targus Lap Chill, Thermaltake Massive23, Cooler Master NotePal X-Slim, and my new favorite the Havit. I’ll compare the noise levels of each as well as showing you how much airflow each one puts out using smoke. What makes the Havit cooler so special is the combination of its slim design, study construction, high airflow, and silent fans. It has two very convenient strong fold-able feet in the back which gives you a more comfortable typing angle. An extra USB port so you don’t lose the one you plug your cooler into. There are plenty of intake vents so even if you’re setting this on a blanket, a couch cushion, or your bed, it can still take in air from the front and sides which is very well thought out! One of the worst things you can do to your laptop is leave it on a soft surface, like your bed for a long period of time. 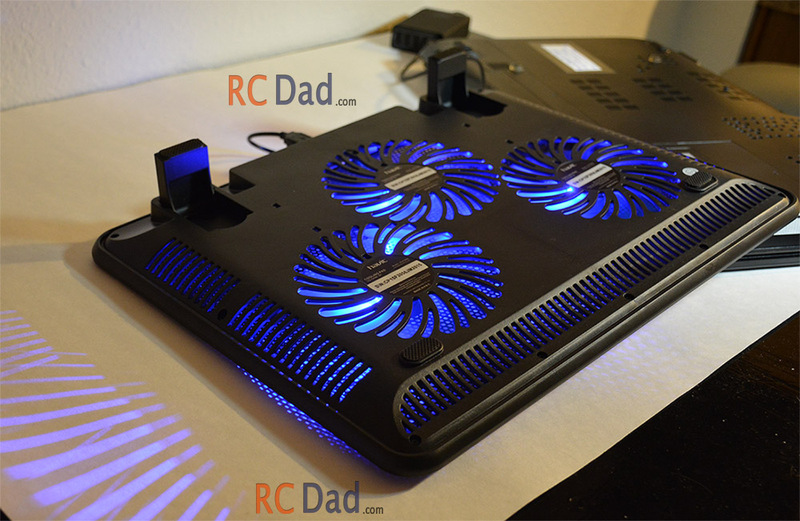 The metal top is very sturdy and doesn’t bend like a lot of other coolers. I was a little worried because of how thin it is and how heavy my laptop is. I thought it was going to bend and scrap against the fans but even after pressing down, I wasn’t able to bend it far enough to hit the fans. 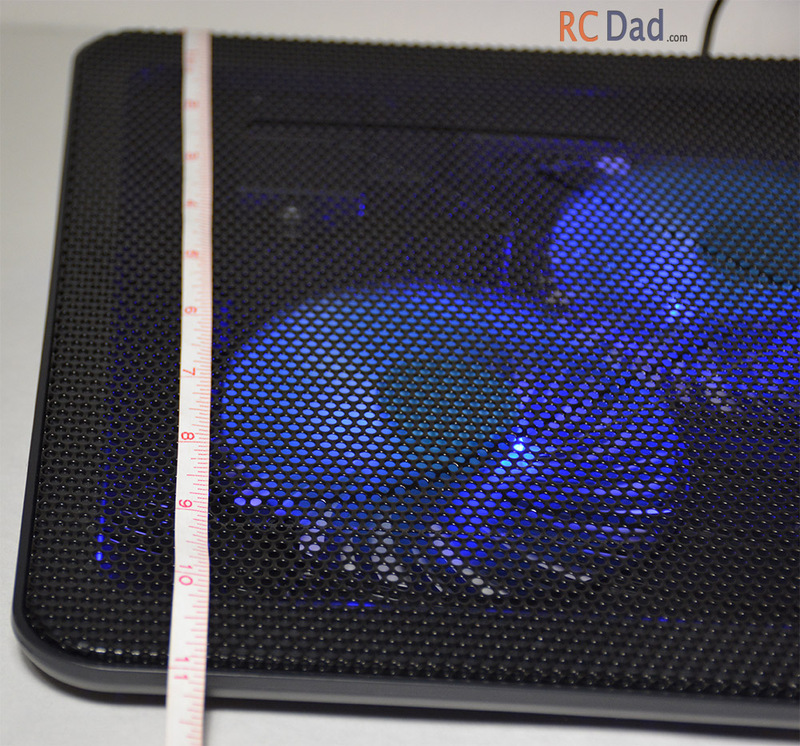 The cool looking blue fans do an amazing job at pushing a ton of air evenly over the bottom of your laptop. I like to move mine a little further back so the front of the cooler blows air over my wrist during the summer. 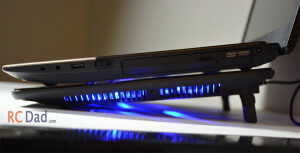 I’ve tried laptop coolers that pull air down instead of pushing it up toward the bottom of your laptop and it made little to no difference in the temperature. I’ve also had bad experiences with “adjustable dial” that allowed you to increase and decrease airflow. It ended up wearing out of staying on the lowest setting. 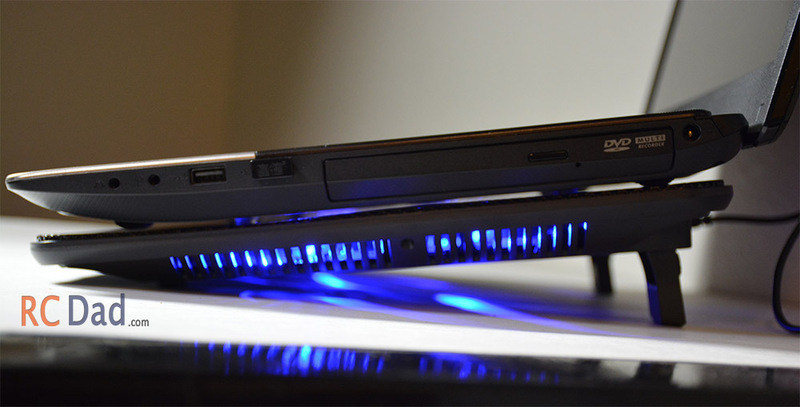 Depending how low you laptop sets, you can even get these little rubber feet and attach them to the bottom of your laptop to allow even more airflow to pass under your computer. My second favorite is the Thermaltake Massive23. This cooler rocks at everything except airflow. It definitely puts out a good amount and will work for most people but it’s not as powerful as the Havit or the Cooler Master. I bought this one to leave at work. I’m constantly moving my laptop around and the handles and extremely rigid frame work perfect for me. This is one of the most quite coolers on the market. 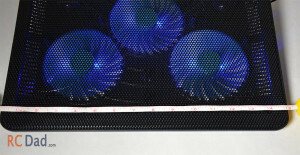 Some people think a larger fan will produce more noise and it’s actually opposite. They don’t have to spin as fast as the smaller fans to move the same amount of air. The construction is also top notch. A nice sturdy metal top with large rubber pads will keep your laptop in place. You also have two switches, one for the fan and one for the light. As well as two USB ports. This cooler is better for desk or hard surfaces and not for your lap or the bed. If you’re not going to be traveling with cooler then I highly recommend this one. 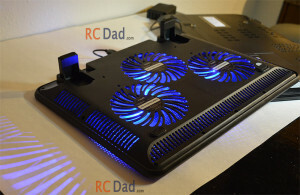 A good runner up is the Cooler Master NotePal X-Slim which has a lot of the same advantages of the Havit Cooler but its biggest downfall is the noise. If noise isn’t an issue for you because you wear headphones and you want a very powerful cooler that’s a little less money, then the Cooler Master is a great choice. Last we have the Targus Lap Chill Mat. I bought this one for my girlfriend because she’s always setting her laptop on the carpet, bed, or her lap. This one is perfect for people looking for a comfortable cooler to set on their legs. The soft padded neoprene adds some cushion and the sides allow for plenty of air to flow under your computer. The things I don’t like about it is the plastic top and the noise. 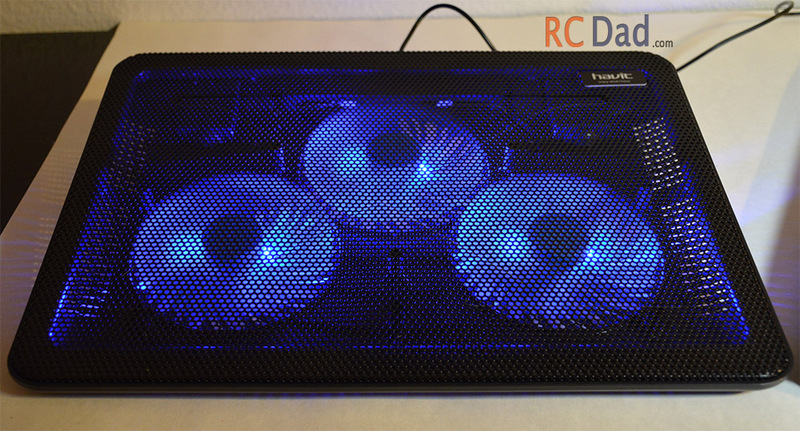 It’s not the noisiest one I’ve tested but I was expecting something a little quieter from Targus. But even if you’re not always turning it on, it’s definitely a great alternative to just placing your computer on your lap! Thank you for watching my review! Make sure to keep up to date with future reviews by subscribing and if you like the video please thumbs up.